Which investing strategy should I use? Is Stock A better than Stock B, or the other way round? How come my numbers don't tally? What if I don't have time to monitor the market and can't buy or sell in time? Welcome to the world of investing and all the stress associated with it. Except that it doesn't have to be. There are a group of investors who don't track the market and who don't select individual stocks, but still enjoy market-weighted returns with minimal effort. That's right, I'm referring to index investors. And if you wanna be like them, here's an introduction into their world of indexes and ETFs. Don't know which stock to pick? Then don't! While I personally enjoy the research and stocks selection process, I know of many people who don't, or who simply don't have the time for it. I know how that feels like, especially when you feel like you've a million and one tasks on your to-do list to accomplish. Enter Index Investing - a strategy where you invest in exchange-traded funds (ETFs) that closely track an underlying index instead of selecting individual stocks to put your money in. It's a lot easier and takes up less time. I've previously shared about one of my biggest must-haves in investing: keeping costs low, and ideally below 1%. Index funds are often the lowest-cost financial instruments available to a retail investor, simply because there's no active portfolio manager who needs to be paid. 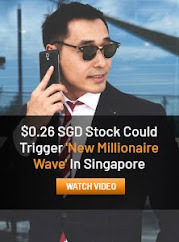 You also get immediate access to multiple stock holdings without having to pay more. Low costs lead to better returns, and are usually a more accurate predictor of investment performance than anything else. Ever heard about not putting all your eggs in one basket? ETFs are the easiest ways to diversify your portfolio, because they can offer you exposure to different markets and industries within a single purchase. 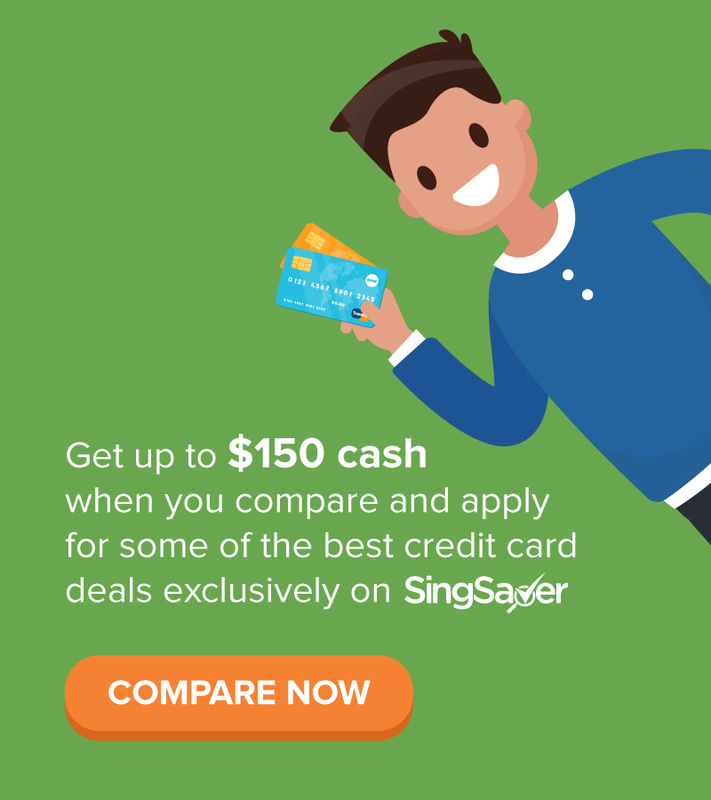 For instance, imagine if you wanted to buy 1 lot of each of Singapore's top 30 companies by market cap. That will cost you at least $750 in brokerage fees and a sizeable 5-digit sum, but you can bypass this by simply buying the STI ETF instead. It'll cost you wayyyyy less. Some investors think ETFs are boring. Nothing could be further than the truth. Most people think of market or country indexes, but there are also industry-specific ETFs, and even thematic ETFs. For instance, did you know there's an ETF ticker called SLIM? Everyone laughs whenever I mention this, but I'm completely serious. SLIM is an ETF that invests in and tracks the performance of the global companies who would benefit if obesity numbers continue to grow. Check it out here. Or, if you believe that Millennials are going to be responsible for the majority of consumer spending in the next few decade, with companies such as Netflix, Starbucks and Google benefiting, then you can also look at the ETF ticker called GENY (Gen Y) here. I love ETFs and think that they're perfect for beginner investors, as well as anyone who wants a low-cost and diversified approach to their portfolio. 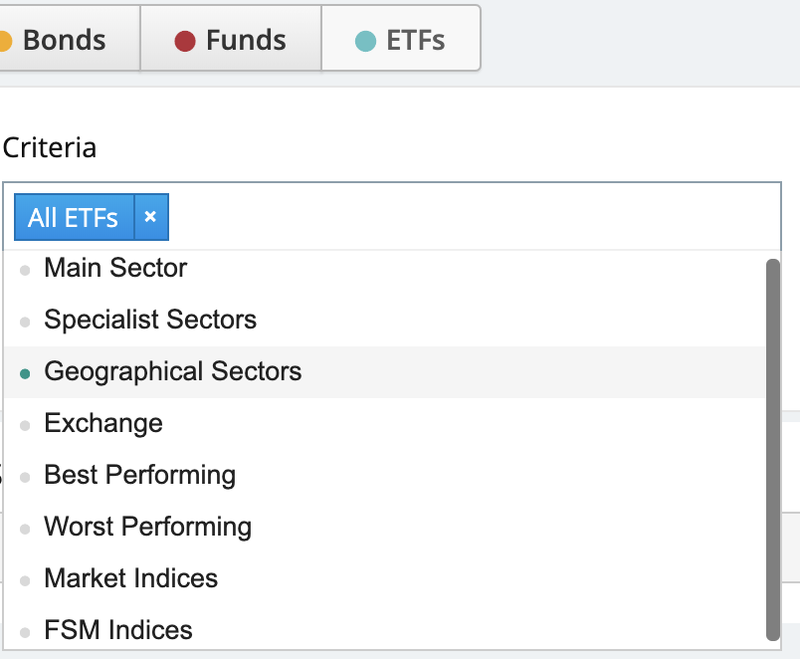 ETFs definitely have a place in my portfolio, and you should explore them too! 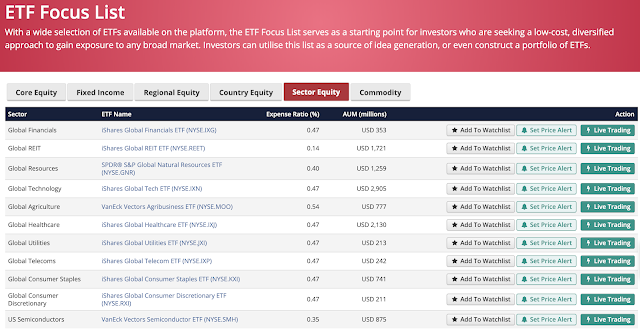 If you’re stumped on what ETFs to invest in, perhaps start your research by checking out this list of curated 42 ETFs by FSMOne’s analysts. 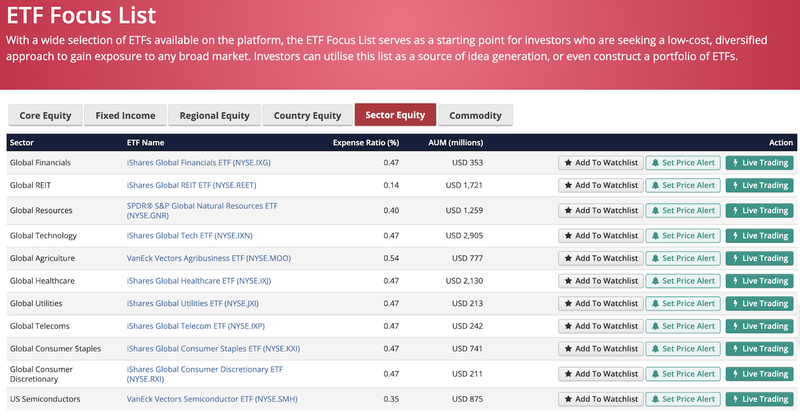 Think of this list as a starting point; your guide to navigating through the sheer number of ETFs available, while you pick up the skills to eventually spot and analyse your own. Many of my readers often ask me, where do you find your investment ideas? 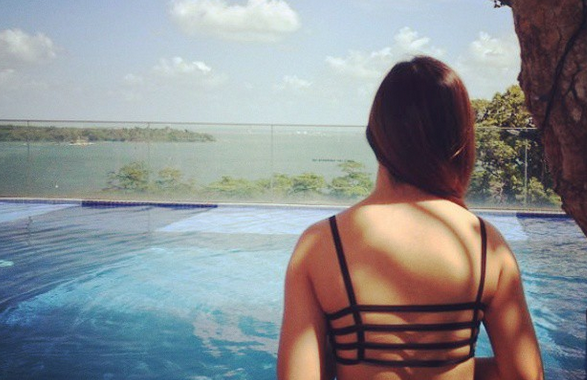 This might just be one such place for you. 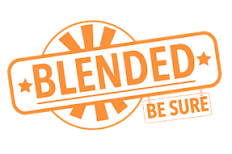 Although the ETFs chosen are by no means a guarantee that you’ll get superior returns over its other peers, they do have an edge over the rest based on the quantitative and qualitative criteria discussed above. Best of all, it’s a free resource for you to start generating some ideas. Who knows, you might find your next perfectly suited investment opportunity here. 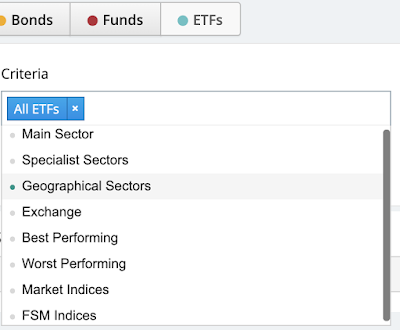 So start exploring the world of ETFs here on Fundsupermart (FSMOne.com)! The list is updated annually by their analysts to highlight ETFs that they think are worth a deeper look into. And if you're looking for more details on ETFs, or wanna talk to the FSMOne folks about them, join them at their upcoming FSM ETFestival 2019 where admission is FREE! You'll be able to delve deeper into the world of ETFs and we'll also be sharing our favourite ETFs that we believe are primed to outperform. 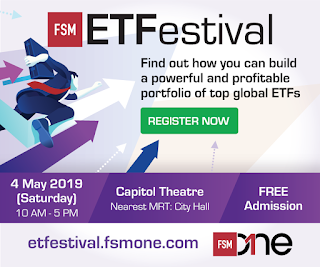 Whether you're a new or experienced investor, you can expect a line-up of presentations from FSMOne.com and other industry professionals from the likes of Nikko Asset Management, which will highlight key market trends and how ETFs can benefit an investor's portfolio. Find out more about the event here or reserve your seat directly via this link!